This reference tool is immensely useful for learning pinyin. 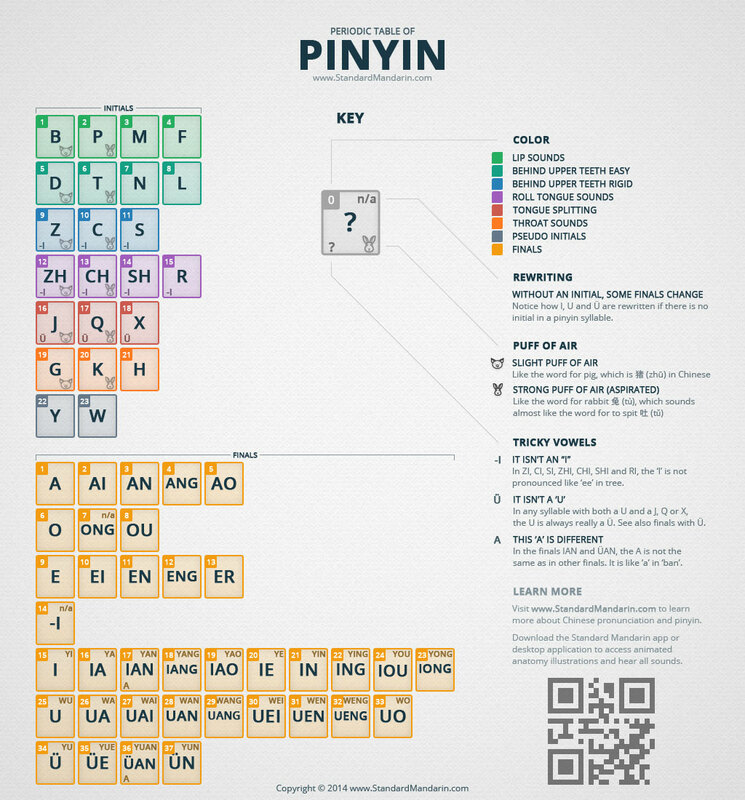 With the Periodic Table of Pinyin you can learn and master one bit of pronunciation at a time. You can even print the chart, and draw check marks on it as you go along. Learning pinyin is essential to learning Mandarin Chinese. In the below chart the entire pinyin system is boiled down to the most concise overview possible. Still it is packed with cross references and help for any learner at any level. Most other pinyin resources will give you long dry texts, with some linguist's description of Chinese Mandarin pronunciation. Instead, this tool is a visually attractive masterpiece, which makes learning Pinyin much more fun. To get even more out of the Periodic Table of Pinyin, you should download the Standard Mandarin desktop software, or the iOS app with anatomy illustrations. There is few particularly interesting things about the periodic table of pinyin. The coloring is not just for the looks. All initials with the same color are pronounced in the same part of the mouth. Interestingly, it corresponds perfectly with the pinyin way of sorting the initials. The initials are grouped together and sorted according to the Pinyin way, not according to their order in the western alphabet. Visually looking at it, what do you notice? Did you notice that pig and the rabbits are not scattered randomly, but they follow a very simple linear pattern down the pinyin table? Did you notice that the initials marked '-I' are all grouped together. The same goes for all initials marked 'Ü'. Thank you for signing up for more! Being a former student of a couple chemistry classes, I enjoy this far more than I thought I would. Thank you for posting such a neat diagram!